One of the latest cases brought to the High Court challenging the Constitutional validity of the Federal Government’s offshore immigration detention program was heard by the full bench on 7 and 8 October. This case is testing whether Section 61 of the Constitution provides the executive power for the Government to fund immigration detention outside of the Commonwealth. Has the executive overreached by making laws to fund the detention of asylum seekers outside of Australia. And by providing this funding does Australia effectively control the detention centre on Nauru? These are questions the High Court will answer. Nauru, a former External Territory of Australia, has been a regional processing centre for Australia’s refugees since 2001. In that year the centre was opened as part of the Howard Government’s Pacific Solution. Australia pledged $20 Million for development activities on Nauru and in return the detention centre was established for up to 800 people. A few months later the number of refugees was boosted to 1200 and as such an extra $10 Million was pledged. Most of the refugees from this initial Howard era were resettled in Australia, but some of them did spend more than five years there in detention. With a change of Government in 2007 the new Prime Minister Kevin Rudd closed the Nauru detention centre and ended the Pacific Solution. The final refugees, mostly Burmese and Sri Lankan detainees were resettled in Australia. With many boats arriving in Australia, the Nauru detention centre was reopened to process asylum seekers in August of 2012. All claims for asylum were also suspended at this time, until July of 2013. The UN criticised the decision taken by the Labor Government and an Amnesty International team described the camp as “a toxic mix of uncertainty, unlawful detention and inhumane conditions creating an increasingly volatile situation on Nauru”. And that “the human rights of these men are being breached by both the Australian and Nauruan Government”. This volatile situation exploded in the middle of 2013 when a fire was sparked during a riot and caused damage to 80% of the centre at a cost $60 million. On the same day, in the lead up to the 2013 federal election, Prime Minister Kevin Rudd announced that all asylum seekers that arrive by boat from that day forward would never be resettled in Australia. 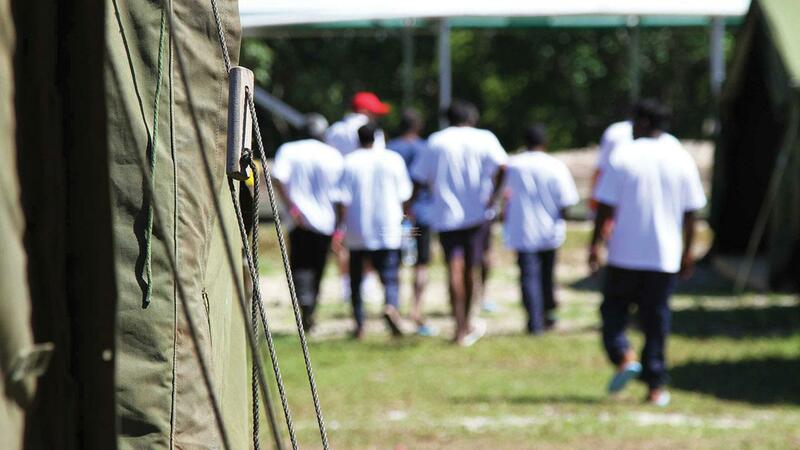 The next month the Nauruan Government agreed to a resettlement agreement. Fast-forward to today and some asylum seekers have been in detention on Nauru since July 2013, and they have been told they will never be resettled in Australia. They have no real future in Nauru with high unemployment and where most people live on only $90-$100 a week. This is a country that recently sacked the magistrate and Chief Justice causing New Zealand to suspend its aid to Nauru, citing diminishing rule of law. And so this is how we get to the latest High Court challenge to Australia’s offshore detention regime. The plaintiff in this case is an Asylum Seeker who was detained on Nauru and was then brought to Australia for medical treatment and subsequently gave birth to a daughter. The lawyers for the plaintiff argued in the High Court that the Australian Government “funded, authorised, procured and effectively controlled” immigration detention on Nauru. While Australia’s Solicitor General defending the Commonwealth rejected this statement by asserting that Nauru is a sovereign nation, not our dependent or our territory and as such the centre is not a Commonwealth detention centre. He stated that the Commonwealth is merely assisting Nauru. The courts must be capable of supervising the legality of that detention. The legal counsel for the plaintiff - following on from the argument that the Australian Government controlled detention on Nauru - claimed that these Constitutional limits do not apply to detention on Nauru. Namely because the detention centre on Nauru is out of reach of the High Court of Australia. This means that the Australian Government can do things in Nauru that they could not do in Australia. A few days prior to the case beginning the Nauruan Government stated that detention on Nauru had ended and the immigration centre was now open 24 hours a day. Permission had been provided to all asylum seekers to move around the 21km2 Island. The opening up of the detention centre does throw a spanner in the works for the plaintiff, as the case does hinge on the legality of detention. But this new freedom does seem curious. If the Australian Government does not control detention on Nauru, then it could be seen as convenient that detention has ended just in time for this High Court case. The legal counsel for the Commonwealth argued that if there is no detention, there is no case. In an attempt to overcome this the plaintiff reasoned that there is nothing to stop the decision to end detention in Nauru being overturned in the future. We will have to wait for the decision of the High Court. CEFA will keep you updated on the case.